With its extensive experience in deployment and support, CAS has developed services that meet the challenging needs in the area of IT operations by increasing operational efficiency. Evaluative study of the environment with the objective of defining the structure of the current scenario of the client and present a project aligned with their expectations, highlighting the requirements for migration from the current scenario to that proposed. Validation testing of the backup environment offers evidence of the safety of current infrastructure, allowing the identification of improvements that fully meet the requirements of the company. Security assurance is an important tool in meeting the requirements of the SOX Sarbanes Oxley law. The Disaster Recovery scenario simulates failures and validates the ability of the backup environment to return to operation efficiently. This reduces the possibility of failure and the impact caused by unforeseen disruptions and ensure the successful continuity of their business. The integration of backup software with databases and applications provides protection and recovery of data quickly, ensuring the availability and the ability to integrate, manage and control operations centrally. The backup database and applications can be performed with or without interruption, depending on the needs of your company. The mirror system offers the option of allowing the availability of a data backup to be performed more frequently and with a faster data recovery, avoiding adverse impact on your company’s business. Gain speed and efficiency of backup operations: our customers rely on the expertise of our certified specialists, the experience of 10 years in the market for CAS and the strong partnership with EMC. Reduce the risks, decrease costs and add value to your operations: we offer an on site service with highly skilled professionals working in diverse areas of backup, for companies of all sizes and sectors. Library of best practices: based on ITIL methodology our professionals have an excellent knowledge base and extensive experience in backup. Knowledge Transfer: Our experts are able to share information solutions that enable efficient, agile and the acceleration of the learning curve of internal resources of your company. Operating activities: monitoring by our experts ensures that operational inconsistencies which require corrective action are identified. Management infrastructure: activities such as installation and recovery, backup and recovery validation, interface with EMC support, and reports and documentation are performed with efficiency by our team. We adopt in the routing running of an organization a combination of protection technologies and data retrieval. Through its planning practices CAS Project Management offers a more proactive and collaborative approach with those professionals involved. 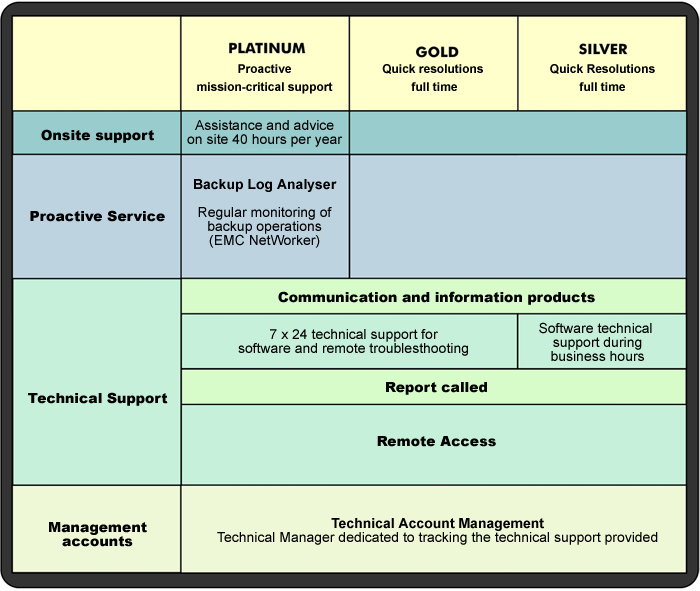 Learn about our levels of support to discover the one best suited to your company.